It’s Sunday again and that means it is time for another look at what has me excited about the new workweek. My summer classes *officially* start tomorrow, even though I have already completed a chapter’s worth of work for my German class. Tuesday: The Library is Open Again! The library that is closest to me was closed all of last week for emergency repairs. I have two books on hold that I haven’t been able to pick up; so, it will be great to finally get my hands on them. Wednesday: The Heat Wave Breaks! California is swelter in temperatures well above one hundred degrees and will do for the first part of next week. If the weather reports are to be believed, the heat wave will break by Wednesday . . . when it will only be ninety-seven degrees. Thursday: Finishing My Cultural Presentation! For my German class I have to complete a presentation about the author Heinrich Böll. I’m already ahead in the class and I would like to get this requirement out of the way as soon as I can. When I’m ahead, I like to stay ahead. Friday: Last Academic Day of the School Year! 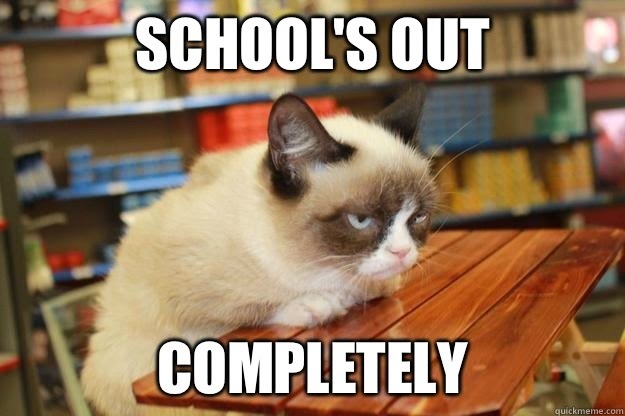 Friday will be the last day that students have any academic-related work to do. It’s time for videos, signing year books, and giddy goodbyes. The kids’ excitement is infectious and I can’t help being as enthused about the upcoming summer holidays as they are. Saturday is graduation day at my school and I am emotional just thinking about it. This class has been with us for three years and it literally feels like we are saying good bye to family members. I’m so proud of them and so sad to be saying “Good-bye” at the same time. Tomorrow is the school’s official last day before summer and we have two BBQs planned: one for the students and one for the staff at one of my colleague’s homes. For some reason, Mondays are not as intimidating when you know there will be two buffets.